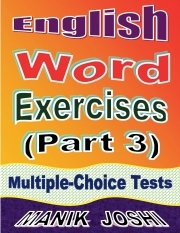 Description of "English Word Exercises (Part 3): Multiple-choice Tests (eBook)"
01. Many motorists abandoned their vehicles and waded through knee-deep water which ________________ on carriageways. 02. Officials have cited ________________ of funds to complete normal maintenance work. 03. _______________ to heat causes skin disease and other fungal infections. 04. Authorities imposed curfew-like restrictions and suspended mobile internet services to contain the ________________ situation. 05. Do not hesitate to speak the truth, however ________________ it might be. 06. It would be ________________ to talk of victory, not to mention absolute majority. 07. We have an ________________ talented team of writers on social media. 08. A car tore through the security ________________ laid around the road by the police. 09. They need to take prompt action in this matter to ________________ the interests of students. 10. Media ________________ from speculation due to sensitivity and seriousness of the issues. Manik Joshi was born on Jan 26, 1979 at Ranikhet and is permanent resident of Haldwani, Kumaon zone of India. He is an Internet Marketer by profession. He is interested in domaining (business of buying and selling domain names), web designing (creating websites), and various online jobs (including 'self-publishing'). He is science graduate with ZBC (zoology, botany, and chemistry) subjects. He is also an MBA (with specialization in marketing). He has done three diploma courses in computer too. ManikJoshi.com is the personal website of the author. Reviews of "English Word Exercises (Part 3): Multiple-choice Tests (eBook)"